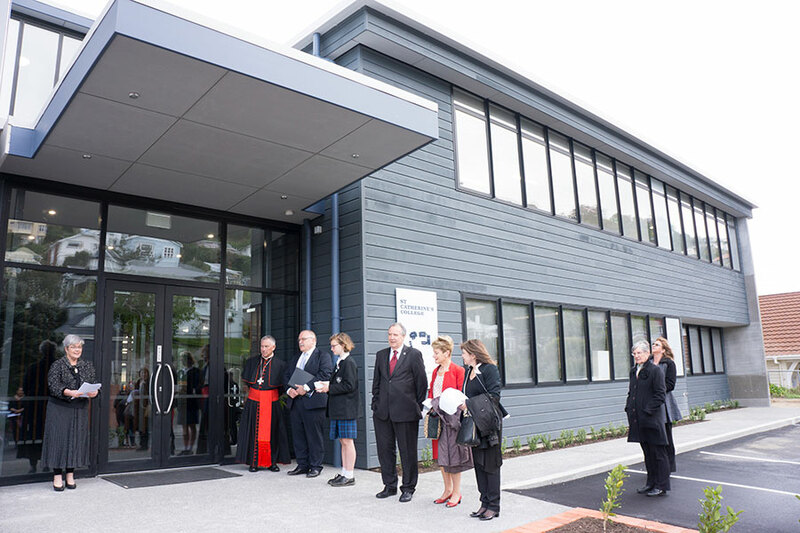 Outside the new administration and learning centre, Principal Mrs Mary Curran welcomes Cardinal John Dew and other guests. Just over a year ago Cardinal John Dew led an early-morning blessing of the site of a new teaching and administration block at St Catherine’s College Kilbirnie. On Friday 14 October, Cardinal John along with Principal Mrs Mary Curran, Chair Board of Proprietors Mr Nigel Prince, Srs of Mercy Congregation Leader Sr Katrina Fabish, Chair Board of Trustees Mrs Michelle Smith, Chair Tiaki Manatu Mercy Ministries Mr Tony Harkins, other proprietor and board members, as well as teachers, college leaders, students, parents and past students, came together for the naming and blessing of the new administration building and learning centre – Te Atawhai, Mercy. The new building includes 11 classrooms and breakout areas.